when did a Friday behave like a Monday? proclaiming TGIF to the whole world! archipelago, its high tide and low tide. and throws you every curveball in the book. enough energy to crawl into bed, much less ring out a resounding “TGIF”. Does this happened to you? lucky you…send some good juju my way when you’ve got a moment won’t you? cupcakes. And Guinness. And peanut butter. heat and stir until the butter is melted. Remove this from the heat and whisk in the cocoa. Transfer to a big bowl and set aside. along with the flour, baking soda, and sugar, and whisk to combine. place in a pre-heated 160C (325F) oven. remove to cool completely on a wire rack. cooling, get on with your frosting. the frosting onto the waiting and completely cooled cupcakes. (and rainbow sprinkles!) for the remainder instead. all its school kid nostalgia, is the perfect complement. Donna Hay…another reason for me to love you. You had me at Friday. And Guinness. And Peanut butter. And cupcakes. I think this is my favorite Friday post ever! ;)Thanks for sharing. "Because really, who can? " he he :), I would say nobody can. Agree on Fridays, it's really special day. Peanut butter frosting? Count me in! Looks tasty~ This is my next Friday's dessert menu. Hi Bluenotebacker! Thanks! Love all of those things…so this recipe was perfect! Hi Ling! The duvet/pillow cave was definitely the ticket! Hope you are feeling better! Hi Palpark! Hope you enjoy it! Looks amazing! Can't wait to try! yummm! This feels so autumn. Cannot wait to try. Heard all about the terrible rain and flood there in Manila! I think everyone deserves a beautifully crafted cupcake after a long, hard day! This is a piece of heaven! 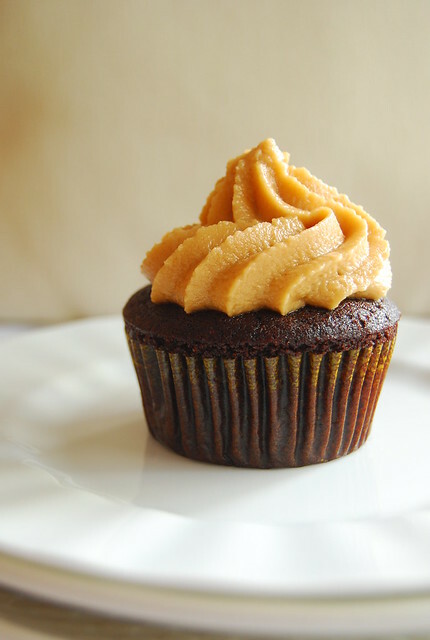 Wish I could lay my lips on that sweet peanut butter frosting right now! Ooh-yeah! Hi Spoon Fork Bacon! We don't have an autumn so we have to made do with cupcakes like these 🙂 Hope you enjoy them! I know what you mean, in my work, assignments come pouring in on fridays so it is seldom I get to utter TGIF. The cupcake looks delish by the way, if only I could bake. Hi Marjorie! I can commiserate! Baking is easy…you just have to take it a step at a time 🙂 And you'll be able to satisfy any craving! Guinness in a cupcake? AWESOME!!! Sounds so good with the peanut butter frosting. Thank you Joey for sending us a few of these to try. They were so good that they made my day! See you and C very soon! Hi Sanju! So happy you enjoyed them! 🙂 Yes, let's please get together soon!